The rise of Inverclyde as an important shipbuilding area has its roots in the eighteenth century. At that time most vessels trading to Scotland across the Atlantic were built in the American colonies. Shipbuilding in Inverclyde was limited to the construction of vessels for herring fishing and other small craft. It was for the construction of such vessels that John Scott established his yard in 1711 at the site of the Westburn East yard. This was the beginning of a long history of Scott's shipyard. The herring industry at that time was a considerable enterprise, providing work for local fishermen and shipyards. By the middle of the eighteenth century Greenock had a fleet of several hundred boats each employing at least four men. From this base the first steps were taken in the building of more elaborate vessels. In 1764 the first square rigged vessel built in the area, named the 'Greenock', was launched from the shore at the bottom of Charles Street by the builder, Mr. McKirdy. Built for the West India trade it was the beginning of shipbuilding for ocean going vessels. The industry began to develop rapidly in the latter part of the eighteenth century. Scott's built the first vessel constructed on the Clyde for non-Scottish owners in 1765. By the 1780's John Wood's yard was operating in Port Glasgow and by the last decade of the eighteenth century Scott's were regularly building the largest vessels in Scotland. The success of the early period had been helped by external events such as the loss of the American colonies and the demand for vessels caused by the Napoleonic wars. This made British merchants and the Government look to new sources for vessels and it was this opportunity that the yards in Inverclyde were able to exploit. As the Inverclyde area became a flourishing port and shipbuilding area many other builders and associated industries came to the area. Ropeworks, canvas manufacturers, foundries, sawmills and many other industries developed in tandem with the shipyards and were frequently owned or part owned by the shipbuilders. The first warship built by Scott's was the 'Prince of Wales' in 1806. This was the beginning of Scott's long connection with the Royal Navy and its high reputation as a builder of naval vessels. By the 1820's vessels were being built by several yards for the East Indian trade and were sailing directly from Greenock. Greenock became the second largest port of register in Scotland with 425 vessels registered in 1828. As a major port the application of Customs & Excise duties became an important activity. Small swift craft were needed to reach vessels and it was for this purpose that the revenue cutter was developed. The design of the vessel drew on the experience of local yards in the building of boats and yachts and produced a vessel of speed and elegance. The construction of yachts was undertaken by shipyards such as Scott's, Robert Steele's and others who were otherwise engaged in the building of ships. As well as building yachts the Scotts and Steeles were amongst the foremost of the west of Scotland's yachting families. In later years they became noted for the building of steam yachts such as the 'Margarita', 'Cassandra', 'Greta', Lord Inverclyde's 'Beryl' and the Aegusa which was renamed 'Erin' when owned by Sir Thomas Lipton. The initial idea for the building of the Comet came from Henry Bell. Although he had some technical experience, it was his visionary enthusiasm that brought the project into being. Previous attempts by others to use steam power had been abandoned and although individuals such as Lord Nelson supported Bell's view, the mainstream of opinion was either hostile or unconvinced. After failing to persuade others to follow his ideas he determined to prove the effectiveness of steam power by having a vessel built on his own account. In 1811 he ordered a vessel from Messrs John Wood and Sons of Port Glasgow. The keel was laid in October of that year. The location of John Wood's shipyard was in Shore Street, Port Glasgow on the site of what later became the yard of Robert Duncan & Co. John Wood had been taught shipbuilding by his father and had spent two years in Brocklebank's yard at Lancaster. He had taken over the yard in 1811 when his father died. The building of the Comet was to be his first solo task. Henry Bell had seen what was later to become the engine of the Comet as it was nearing completion in the works of John Robertson of Dempster Street, Glasgow. Originally intended for use on the land as a pumping engine it was modified by Robertson later on, raising the cost from £165 to £365. The vessel's boiler and castings were made by David Napier. As Henry Bell did not have any ready money to pay for the boiler he gave Napier a promissory note for £62. This was subsequently renewed and was never redeemed. Napier later established works at Camlachie and Lancefield, earning for himself a high reputation as a marine engineer. The Comet was launched on 24th July 1812. It was the first steam powered vessel in Europe to carry fare paying passengers. Bell's initial success soon convinced others and by 1816 the Comet found herself incapable of competing on the Clyde against vessels which had been constructed after her. Bell decided to try his fortune on the Firth of Forth but the same situation arose so that by 1819 Bell was looking for more profitable territory. This, he hoped, lay in the Highlands. Given that there was then no tourist trade a large volume of business could not be expected. However there was initial success. By December 1820 a net profit of £640 had been made. Unfortunately the real profitability of the run was never to be ascertained as the vessel was shortly to meet its end. On December 15th 1820 the Comet was returning from Fort William and had nearly reached the safety of Crinan when the racing tide of the 'Dorus Mhor' off Loch Craignish caught her, proved too much for her engine and she was driven ashore onto the rocks. The passengers ,including Bell, managed to scramble ashore unharmed. The vessel remained fast and its aft end broke off leaving the engine and fore end on the rocks. Although the vessel was lost, the engine was salvaged and continued its life elsewhere, at first in a coachbuilding works in Glasgow and then in a brewery in Greenock before reaching its final resting place in the Science Museum in London. The importance of steam driven vessels grew in the first half of nineteenth century as they slowly began to make inroads into the areas that had previously been the sole preserve of sailing ships. Inverclyde shipbuilders rapidly followed the example set by the building of the 'Comet' by Henry Bell and acquired the skills and facilities to provide themselves with suitable sources engines, boilers and other necessary parts of the new technology. John Wood's yard in Port Glasgow followed their success with the 'Comet' by producing a notable list of steam vessels in later years such as the early Cunard vessels. The firm of Scott's purchased an already existing iron foundry in 1825 and this became the basis for the marine engine side of their business. The first Clyde built steam naval frigate, 'H.M.S. Greenock' was launched by Scott's in 1839. In addition to shipbuilders branching out into engine construction, firms already engaged in that field saw the building of iron ships with steam engines as natural extension of their activities. The most notable example of this in Inverclyde was the firm of Caird & Co. which had started out as a foundry in 1809, began to make machinery in the 1820's and had established a shipyard at the Cartsdyke Mid Yard in 1840. Caird's had a high reputation as builders of quality vessels and engines and in their early years excelled as builders of elegant paddle steamers. The skills of shipyard workforce changed as engineering ability in metal began to play a more important role in ship construction than that of the carpenter. The last traditional wooden vessel built in Greenock, the 'Canadian' was launched in 1859. After that date composite or totally metal hulls were the basis of shipbuilding in Inverclyde. The firm of Robert Steele & Co. turned to the building of Tea clippers in the late 1850's . The firm had experience of building vessels for work on long routes. 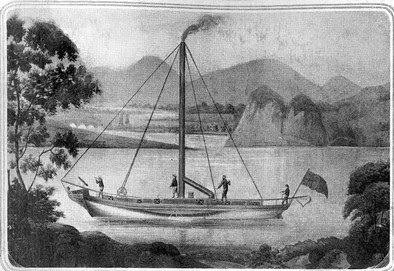 The brigs they had built for the West India trade were particularly noted and they also constructed specialised vessels such as seal fishers. William Steele was in control of the designs and Robert Steele looked after the materials, construction and workmanship. They had been building steamships since the 1820's and were thus a firm with wide ranging experience of both the traditional and the new shipbuilding skills. 'The Falcon' (1859) was an early success and through experience gained in the construction of the other early tea clippers he was able to evolve what was to become the classic composite construction clipper. Long and clean , his vessels had few competitors in the rest of the world and as the 'Great Tea Race of 1866' showed the only real rival for one Steele's vessels was another vessel from the same yard. After having travelled from China in 99 days the 'Ariel' and 'Taiping' arrived at the Channel coast with only ten minutes between them. The prize premium on the first cargo of that seasons tea was split between them. Indeed Steele's other vessels such as the 'Serica' and 'Taitsing' were making such fast passages that the tea merchants gave up paying a premium on the first cargo to arrive since so much tea was arriving at the same time. Financial difficulties unconnected with shipbuilding forced the yard to close and it became part of Scott's shipyard in 1883. The period 1875 - 1914 saw the fullest development of Inverclyde's shipbuilding industry. Some firms such as George Brown & Co. at the Garvel Yard concentrated on coasters, tugs, motor yachts and other specialised vessels. Ferguson Brothers at Port Glasgow's Newark Yard specialised in similar vessels. Another specialist was Murdoch & Murray who operated from their yard at Brown Street in Port Glasgow. During the Amazonian rubber boom before the First World War they built small steamers for the rubber traders. The rise of the Russell, Rodger & Lithgow partnership and the subsequent emergence of Lithgow's was one of the most notable changes in this period. It was to became the largest privately owned shipyard in the world. Throughout the period prior to the First World War Lithgow's yards were frequently the No.1 Clyde yard producing more tonnage than any other. During the period 1912 - 1914 the yard's tonnage was some 232,000 tons. In the years after the First World War depression hit the industry. This resulted in the disappearance of many yards as they closed or were absorbed by other firms. Scott's continued to produce outstanding vessels but others were less fortunate. Caird's, Duncan's & Hamilton's were some of the famous names to either disappear or be taken over. The depression in the shipbuilding trade lasted until the outbreak of the Second World War when the yards once again had a full workload. 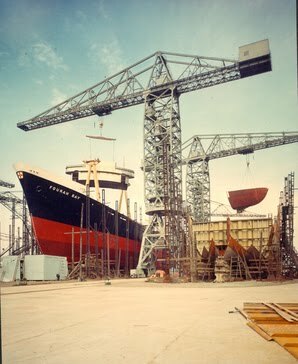 After the war the shipbuilding industry in Inverclyde faced growing competition, especially from abroad, which resulted in a period of restructuring and closure in the 1970's and 1980's. By the last decade of the twentieth century only one fully operative shipyard remained in Inverclyde.